for me, being a lover of all books, i never cared about how my library "looked". the library in my elementary school was in the center of a circular classroom setup. it was concealed by beige-y, boring cubicle walls. i wouldn't even call it a library. it was a cubicle of books. images of the Robin Hood Foundation's work are so inspiring. i wish they could have done my libraries from elementary to high school. 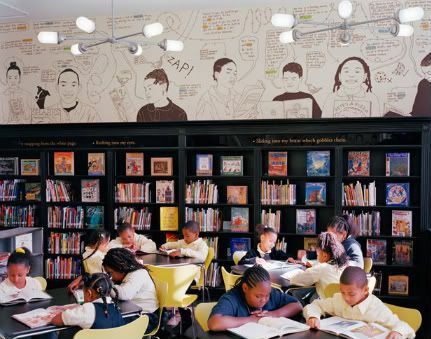 a library should be a nest, a safe-haven, a refreshing space where kids can go and find their solace in reading. see more photos and the story here.